Could this be the best value in bourbon? At $25 per bottle for a 12-year-old bourbon it certainly has potential, especially considering that similarly aged bourbons seem to be regularly selling for double the price. W.L. Weller is made by Buffalo Trace, which makes a bevy of my favorite bourbons, including but not limited to Blanton’s, Elmer T. Lee, George T Stagg, Eagle Rare, Pappy Van Winkle, and, of course, Buffalo Trace. Weller uses a wheated bourbon mash bill. All bourbon uses at least a majority of corn, but a wheated bourbon uses wheat instead of rye as the secondary grain. Along with the 12-year variety, Buffalo Trace produces the Special Reserve, the 107-proof Antique, and the high-end William Larue Weller, all of which are part of the Antique Collection and bottled at barrel-strength. The nose features lots of sweetness, with vanilla, caramel, and a bit of leather. The 90-proof (45% ABV) spirit is a reddish bronze color. On the palate it has sweetness and wood, but there are also hints of orange marmalade, allspice, and vanilla. The finish is medium and smooth with damp wood and honey. It’s a bit thin compared to fellow 12-year-old bourbons Elijah Craig (which is similarly priced) and Van Winkle Special Reserve (which is a bit more pricey), but the it has a great combination of balance, wood, and sweetness, especially considering the price. That combination of sweetness and balance means it will pair with a wide variety of cigars. I can just as easily recommend a mild, woody Dominican as a full-bodied, earthy Nicaraguan. Classic Cuban smokes like Cohiba and Montecristo also go great with the Weller 12. Whether the plastic-capped W.L. 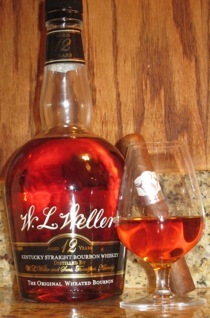 Weller 12 Year is the best value in bourbon is up for debate, though it’s clearly in the conversation. But there’s no doubt it’s an excellent value that should be on any bourbon aficionado’s list, and can be enjoyed with nearly any fine cigar. Nice review, I'll have to look for a bottle of this on my next trip to the liquor store. Thanks for the kind words. You may have to look around a little for the Weller 12. The word is out that this is good juice for a value price. Brilliant review! I don't think you can be more right (and I rarely agree with anybody 100%). I'm currently smoking a Don Carlos #2 and sipping some W L Wellers right now. It really is a great wheated bourbon and a steal for the price. I'd compare it to Makers Mark with more of an oak finish. I think your tasting notes are spot on. I'm telling ya, with a glass of WL Wellers neat, and an Arturo Fuente, it's hard to find much else better.